Summer is just around the corner, that means time for tanning, swimming and just relaxing at the beach! And that also means that you can show off your gorgeous bump. But we understand that it can be quite difficult to find the right bathing suit or bikini. Luckily we found some really fashionable ones. Take a look at our list, and start getting ready for the beach! H&M already has a great MAMA collection. Therefor they also have MAMA swimwear. Don’t you just love these two bathing suits that we have selected? You can opt for a green one or one with a fun print. It is up to you, but you will definitely look gorgeous at the beach! All we can say is that we love ASOS and all that they have to offer for moms-to-be.We found a gorgeous tankini set with flowers and ruffles. The other one has a gorgeous red color and is also with ruffles, it will fit perfectly on your bump. Cache Cœur has an elegant collection of maternity swimwear. We selected a swimsuit called Arizona, which has a gorgeous orange color and cute fringes. But we also chose a yellow bikini, which will look extra gorgeous when you already have got a bit of a tan. Of course Topshop can’t be missed from this list, it’s like we saved the best for last… 😉 They have got great swimsuits, which are perfect if you don’t want too much going on. Like this black ribbed swimsuit or the halter swimsuit which has a gorgeous color for summer! 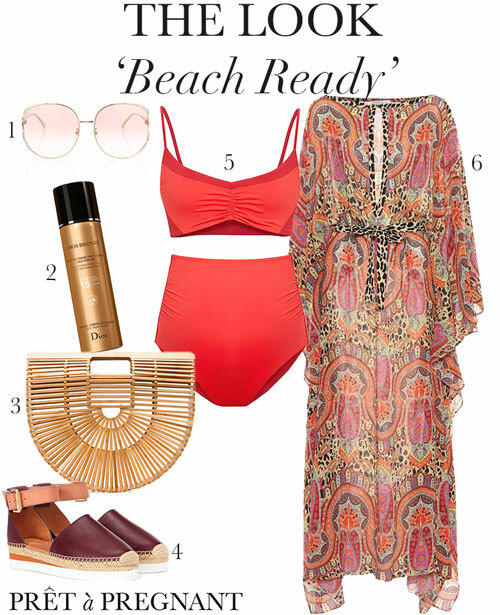 We selected a look for you that is perfect for at the beach! We styled the look with a bikini from Hatch, this one has a pretty poppy color! A kaftan is perfect for at the beach but also during your pregnancy, it is flowy and loose! Combined together with espadrilles and a bamboo bag from Cult Gaia, a bag that is perfectly for everything you need at the beach; magazines and of course the Dior Summer Bronze, to help you get that tan a bit quicker. You will definitely be ready for a day at the beach like this!